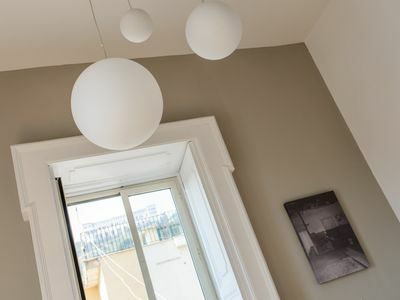 The family-friendly hotel is located in the beautiful and exclusive resort Pra 'delle Torri which may count itself among the top tourist resorts in Italy. 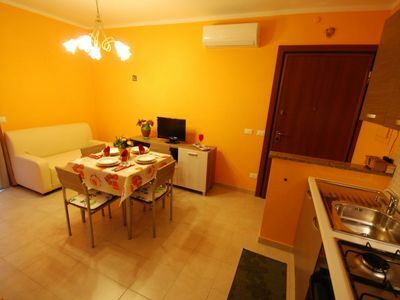 The holiday village is situated on the northern Adriatic coast, near the charming fishing village of Caorle. 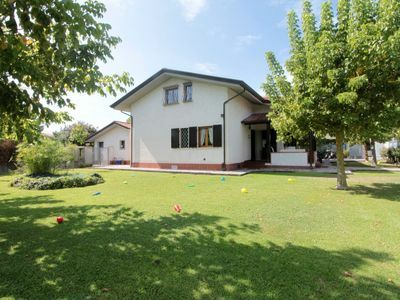 The 1km long, gently sloping sandy beach is located about 300 meters from the property. 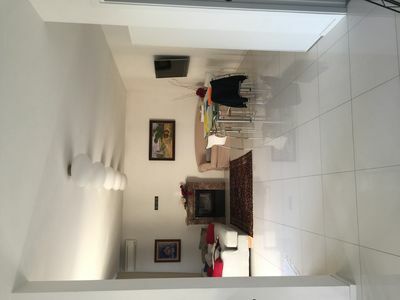 The complex has a wonderful, large swimming complex, a guarantee of fun and action, several restaurants, a supermarket, pharmacy, hairdresser, a shop for sporting goods, bicycle rental and a 18 hole golf course. For your entertainment is well catered for with a friendly animation team and evening entertainment. For the little ones there is a kids' club for the older ones and a young club. For your children, there are also several playgrounds, and a Luna Park. 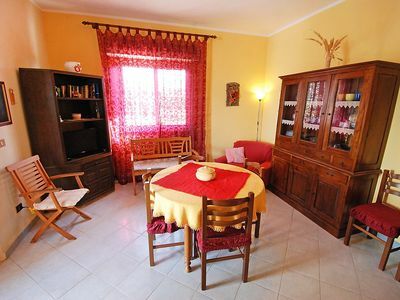 This beautiful row house with 40 sqm is walled and suitable two-storey and for up to 4 people. The accommodation comprises of a master bedroom upstairs, downstairs living room with two beds can be easily converted into a bedroom. 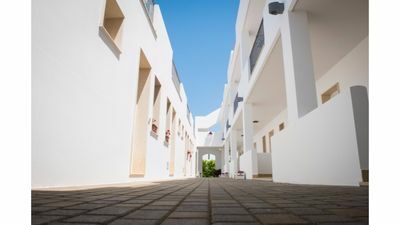 On the ground floor the resort features a well-equipped kitchen available which includes crockery, cutlery and pans, microwave and refrigerator with freezer compartment and connects the dining area to the living area. The newly-appointed accommodation includes: 2 satellite TVs, air conditioning, telephone and daily maid service. The large bright bathroom has a shower and hair dryer, sink and toilet. 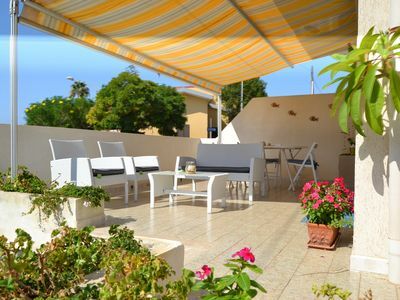 The covered patio with table and chairs and two sun loungers, invites you to relax while the kids can let off steam in the playground or at the pool. 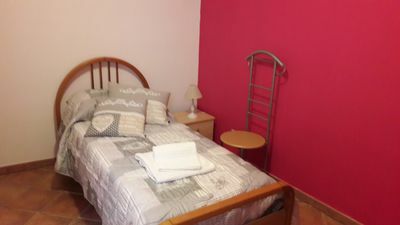 Bed linen and towels (changed weekly) are included. , Optionally WIFI available. If necessary, a travel cot can be rented (when booking reservation). Barbecue allowed. Driving time from Ital. Border about 4 hours. On request, half or full board can be booked on site. Covered parking included. Minimum size of 18 06. - 10. 09. 2015 3 people. To this unit also beach equipment (1Sonnenschirm + 4 deck chairs) is on the beach. 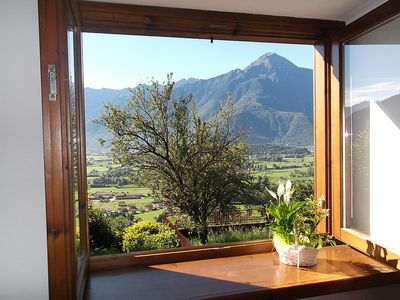 Daily arrival, the minimum stay is 3 nights. The directly adjoining the resort 1 km long and wide sandy beach features which are available for rent, as well as a large open sandy beach with both a section with sun loungers and parasols. The gently sloping sandy beach is ideal for families with small children. Guests are many water sports possibilities: surfing, sailing, canoeing, water skiing, jet skis and pedal boats. Moreover, on the beach: beach volley fields and a fitness zone for stretching on beach. 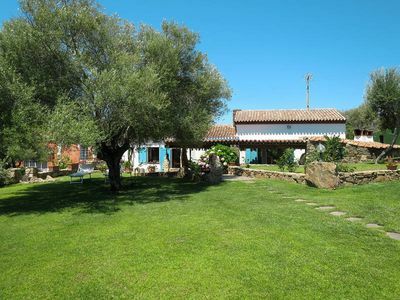 The ideal place to relax and sunbathe or to pursue one of the many sports activities. A quick snack can be taken in one of two beach bars that are open from dawn to dusk and run an inviting, refreshing delicious offering. Lifeguards ensure all day for safety. 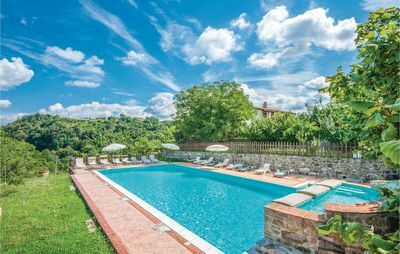 The pool area is stunning: The guests are 3 swimming pools (two heated) available (an Olympic-size swimming pool, a semi-Olympic swimming pool and a smaller). From mid-May to mid-September, the large water park is also open, which beat faster not only children's hearts but also offers a wonderful experience for adults. With water slide, fountains, a "pirate ship" and underwater massage water park has many fun-factor. The jacuzzi tub that guarantees the adult guests complete relaxation. 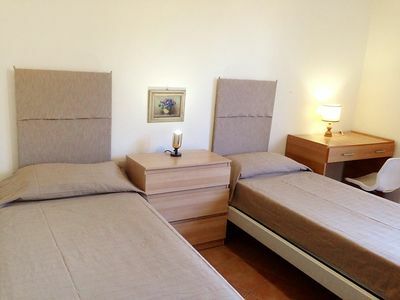 The resort is adjacent to the beach and is ideal for families with small children. 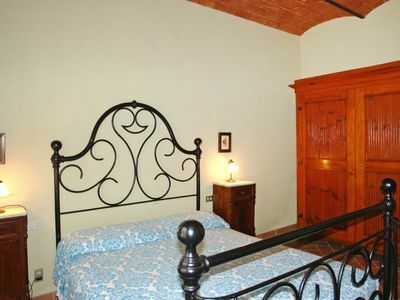 Only a few minutes drive from Caorle, also called 'Little Venice'. In the mid and high season, a group of experienced animators will enliven your stay in a gentle way. Every day held tournaments, various games and sports lessons. Our team organizes aerobics, water aerobics and dance classes. For children aged 5 to 12 years, there is a kids' club. Your children will have the opportunity to participate as protagonists of evening performances. For the teenager is a young club available in which they can try out many activities. Each evening will also cabaret, game nights and guests evenings organized, then disco and / or dancing. Who wants to do sports has a great selection. Volleyball courts, football fields, archery, table tennis, bowls, water sports (for a fee) and a large 18 hole golf course (fee) are available. Those wishing to keep their physiques are spoiled for choice: tennis courts, soccer field, mini football pitch, beach volleyball, archery and a fitness center. For young people aged 11 years and also the activity is park, with lots of activities for you to try, are available. In addition, the animation a varied exercise program for every day along with stretching and water aerobics. On the beach, wakeboarding, waterskiing, sailing boats and canoes can be rented. Bicycle rental is also available. The resort has a supermarket, shops with fresh fruit and vegetables, newspapers and tobacco products and sporting goods. In addition, you will also find a hairdresser and a pharmacy in the center of the village. 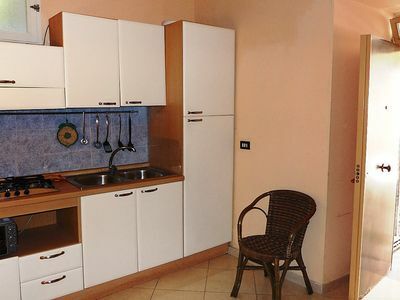 The apartment has a well equipped kitchen with crockery, cutlery and pans, microwave and fridge with freezer compartment. Shopping facilities are nearby. If you prefer to make use of a half or full board, you can also book you on the spot (a request by booking is not necessary). If you want to be pampered, the resort has six restaurants, there is certainly something for everyone here. The travel cot is based on an occupancy of max. 4 people incl. Baby free, up to 4 people is the travel cot free of charge. A covered parking is included. A medical emergency service is available 24 hours available. Detailed information arrival you will receive with your travel documents after booking. The old town of Caorle is exceptional: the winding streets and small squares, the millennial cathedral, the houses of the old convey a warm and friendly atmosphere. Every weekday weekly markets are held in the nearby area of ​​the village. Venice is just 60 km from the resort and is always worth a visit. Did you know that Venice and its lagoon are on the UNESCO list of World Heritage Sites since 1987? 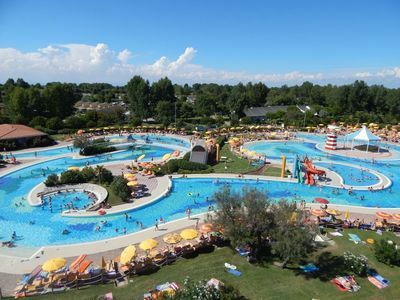 Also not far from the village (Jesolo) are the water park 'Aqualandia' which much more than a classic water park - it is a true pleasure island by subject area with 26 attractions in water (including the longest water slide in the world) and water (including the highest bungee tower in Europe). An amusement park for children and young people, see the 'Jesolandia "which is also located in Jesolo. Nearby is also the Parco Zoo Punta. In 70 naturally designed enclosures more than 1,000 animals live from around 150 different species. Particular emphasis is placed but the Parco Zoo Punta Verde on the flora, and as can be seen not only local, but also many exotic plants. In the information office which is located within the resort, you can get advice on excursions in the surroundings or to register for one of the organized excursions. There are several excursions offered each week. Triple Penthouse in "Donnosanto Residence"